There can never be a dull moment on the Internet, thanks to an army of Twitter users who keep their sharp eyes always wide open. And the latest to become a subject matter on virality on the Indian Twitter space is ‘Rani Mukerji in coma’. 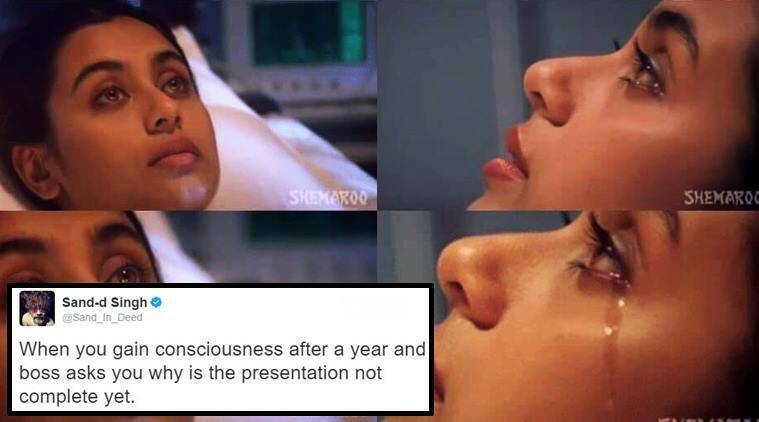 Yes, Twitter users are having a ball making memes of Rani Mukerji crying in coma — a scene from the film Har Dil Jo Pyaar Karega. The film released in 2000 stars Rani Mukerji, Preity Zinta and Salman Khan, with Mukerji in a comatose state, for most parts. Towards the end of an emotional scene in the movie, the actress is seen lying on the hospital bed with tears rolling out of her eyes. Though it must have made for a heart-wrenching part of the movie then, but now the Internet has officially turned her into memes. And they are hilarious and relatable — at the same time! Sample some of the reactions here. Mom : uth ja office nahi jaana? When u are in coma..and started hearing to surya vamsam dialogues in set max..
See what else is going viral here.